Raised in a devout Catholic family, Kathleen Evans was taught the power of prayer from a young age, although her relationship with the Catholic Church has been rather tumultuous. Having divorced at the age of thirty-three, and struggling with being a single mum of four, the lack of support from her beloved parish and priest was a bitter pill to swallow. These trials are only part of the whirlwind that was to come for this inspirational Australian. Diagnosed with terminal lung cancer in 1993, Kath faced the grim reality that treatment would not be a viable option for her. 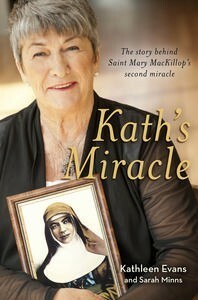 As her health began to improve, stunned doctors could find no explanation for the development, as she was given only a few weeks left to live- but this is only part of her astonishing story, as she reveals in her book Kath’s Miracle co-written with Sarah Minns (Penguin; $29.95). After her diagnosis, Evans and her family sought solace in prayer, and after a dear friend offered a relic of well known Mary MacKillop's, her prayer life turned around. Slowly noticing a change in her health, nothing short of a miracle occurred when a final scan revealed the cancer was gone, only showing scars where the tumours had been. The result of such miraculous healing hence made Evans an integral part of the canonizing of Australia’s first saint, Saint Mary MacKillop, in 2010. A story met with careful consideration of all parties mentioned, Minns helps paint Kath’s story in eloquence and grace. Elucidating the pros and cons of the Catholic Church and highlighting the importance of individual faith and prayer, Evans maintains she is not out to ‘convert’, only to share her incredible story in the hope that people will find hope and encouragement. Admittedly it is only a recent development that I find myself reading the ‘foreward’ in a book; it is a definite must for this one. A vulnerable and beautiful summation of her story, it sets the tone of acceptance and grace. Even if one is not religious, it is difficult to look past the captivating and inspirational life of Kathleen Evans. With no hidden agenda or forcefulness towards prayer or religion, the account is relatable for so many and is truly moving.